A nearly meet-long racetrack celebration of the victory by Zayat Stables’ American Pharoah in the $2 million-guaranteed Kentucky Derby Presented by Yum! Brands (Grade I) and the colt’s subsequent sweep of racing’s elusive Triple Crown will be among its most delightful and lingering images, but there were ample reasons to smile for racing fans, horsemen and racetrack officials during Churchill Downs Racetrack’s (“CDRT”) Spring Meet that ended its 38-day run on Saturday, June 27 under the lights in a “Downs After Dark Presented by Stella Artois & Finlandia Vodka” racing program. 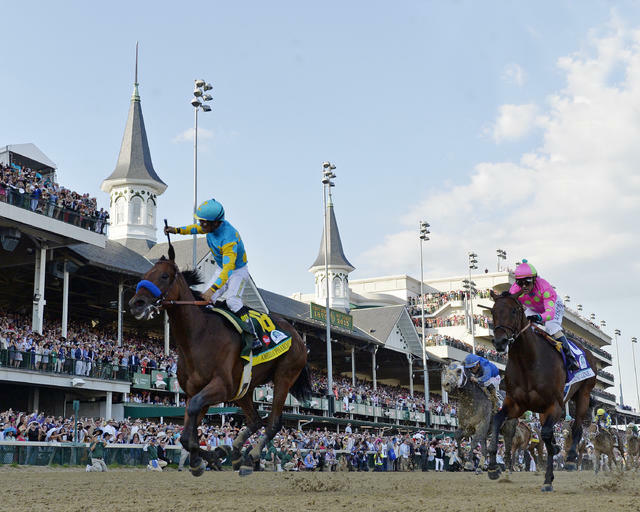 The meet soared from the starting gate with a spectacular Kentucky Derby and Longines Kentucky Oaks (GI) week which generated record attendance and wagering for both of Churchill Downs’ signature events, and record business levels for the six-day racing week. Hall of Fame trainer Bob Baffert brought American Pharoah back to Churchill Downs following his Triple Crown sweep – which ended a 37-year stretch during which no 3-year-old Thoroughbred had won the Kentucky Derby, Preakness Stakes (GI) and Belmont Stakes (GI) – and paraded the sport’s newest superstar before nearly 29,000 adoring fans during the June 13 “Downs After Dark” celebration headed by the $500,000 Stephen Foster Handicap (GI). Baffert and his staff shared their Triple Crown winner with countless fans and visitors at Barn 33 until the colt returned to California on June 18. Other highlights of the track’s 141st Spring Meet included a very promising start for its new “Twilight Thursday” racing programs that featured a compact schedule of eight live races and a first-race post time of 5 p.m. (all times EDT); favorable business levels that combined with Kentucky Derby and Kentucky Oaks Week’s record results to allow a 10% increase in overnight purses during the meet’s last 11 days of competition; a positive reception for the new $4.2 million Winner’s Circle Suites and Courtyard seating and hospitality from the owners of Kentucky Derby and Oaks horses, and from fans who enjoyed races in those new venues throughout the Spring Meet; and a dramatic race for “Leading Jockey” that saw a contest between seven-time leading rider Corey Lanerie and nine-time Churchill Downs riding champion Julien Leparoux come down to final yards of the 38-day meet’s last race. The meet provided good news for racing fans, horsemen and the track as the size of both the average field and average purse for races during the Spring Meet races rose above the levels from the previous year. A total of 2,867 horses competed in 368 Spring Meet races, and the average number of horses-per-race was 7.79, an increase of 6.9% from the 2014 Spring Meet average of 7.29 horses-per-race. The Spring Meet of 2014, which also was a 38-day racing session, included 372 races that attracted 2,712 horses. The total number of horses that competed during the meet rose 5.7% although the 2015 meet featured four fewer races. A race during the 2015 Spring Meet offered an average purse of $55,982, an increase of 0.5% from 2014. Total purses paid during the just-completed 38-day meet totaled $20,601,382, a decrease of 0.6% from the total of $20,728,293 in the spring of 2014, which featured four more races. Daily purses offered during a 2015 meet averaged $542,142, a slight decrease of 0.5% from average daily purses of $535,481 in the 2014 Spring Meet. “While American Pharoah’s Kentucky Derby and Triple Crown heroics provided an emotional lift to all Churchill Downs racing fans, our team and the entire horse industry, the Spring Meet got off to a strong start with a record Kentucky Derby and Oaks Week schedule and continued with good news and solid business levels throughout the meet’s 38 days,” said Kevin Flanery, president of Churchill Downs Racetrack. “Field size and purse levels remain major concerns for our daily racing product, but we offer our gratitude to our horsemen and racing fans in our region, those at simulcast outlets across North American and those who supported our racing through TwinSpires.com and other online wagering platforms. All helped Churchill Downs racing take small steps forward on a challenging competitive landscape during the just-completed meet and we appreciate that support. Both the Kentucky Derby Presented by Yum! Brands and Longines Kentucky Oaks programs attracted record crowds and all-sources wagering. The Derby’s attendance reached a new high of 170,513 and the attendance record for the Kentucky Oaks improved to 123,763. All-sources wagering on the six racing days during Kentucky Derby and Oaks Week – from Opening Night, Saturday, April 25, through Derby Day, Saturday, May 2 – rose to a record $263.3 million, up 4% from 2014’s $253.8 million, and 2% over the record set in 2013. While support for Churchill Downs’ “Downs After Dark” programs, which debuted in 2009, continued to be strong, it was the second of three night racing programs that provided the meet’s brightest post-Derby and Oaks Week highlights. The June 13 “Downs After Dark” headlined by the $500,000 Stephen Foster Handicap (GI) featured the added attraction of a public appearance by Kentucky Derby winner American Pharoah just one week after he had completed the first sweep of racing’s Triple Crown since 1978 with his dominant victory in the Belmont Stakes on June 6 at New York’s Belmont Park. Along with that evening’s popular on-track parade of American Pharoah, the members of his team continued recent Stephen Foster tradition when they accepted their engraved Kentucky Derby winner’s trophies in a ceremony in the new G.H. Mumm Winner’s Circle. Owner-breeder Ahmed Zayat and family were presented with the solid gold Kentucky Derby Winner’s Trophy and a smaller sterling silver replica presented to the winning breeder. Baffert and jockey Victor Espinoza were presented with their sterling silver trophies for winning trainer and jockey. The trophies were the first for Zayat, the fourth for Baffert and the third for Espinoza. Three of the evening’s races were featured in a two-hour live broadcast on NBCSN that kicked off the network’s coverage of the “Breeders’ Cup Challenge Series.” The Stephen Foster Handicap and the Grade II Fleur De Lis Handicap are included on “Breeders’ Cup Win & You’re In Challenge Series” race schedule and their respective winners earned automatic starting berths in the $5 million Breeders’ Cup Classic (GI) and the $2 million Breeders’ Cup Distaff (GI) on Oct. 30-31 at Keeneland Race Course in Lexington, Ky. The combination of the on-track appearance of American Pharoah, the night’s strong roster of four stakes races and “Downs After Dark” entertainment attracted 28,968 on June 13 - the largest attendance figure of the meet outside of Kentucky Derby and Oaks Week. On either side of the Stephen Foster attendance number was the on-track crowd of 30,647 for Kentucky Derby and Oaks Week’s “Thurby” celebration on Thursday, April 30, and the closing night “Downs After Dark” program on Saturday, June 27 that drew 24,192 patrons through the admission gates. The strong 2015 Derby and Oaks Week results combined with favorable business levels after that successful week enabled Churchill Downs Racetrack to raise purses levels for its overnight races for the first time since theSpring Meet of 2012.The higher purse levels started with racing on Thursday, June 11 and continued through the meet’s final 11 racing days. Races that benefited from the increase included allowance races, maiden special weight events, starter allowance and claiming and maiden claiming races. Purses for stakes races were not affected by the increase. The Spring Meet’s new “Twilight Thursdays”, which debuted after Kentucky Derby Week, contributed to the favorable business results. “Twilight Thursdays” offered eight-race programs and a 5 p.m. first post and featured activities on the Plaza that included $1 12-ounce beers, food trucks, live music and a “Handicapping 101” fan education tent. Sales of general admission tickets, box seating and dining increased on Twilight Thursdays over sales for both Thursday and Friday programs in the 2014 Spring Meet to get the new concept off to a promising start. While the triumph by wagering favorite and future Triple Crown winner American Pharoah in the 141st running of the Kentucky Derby will reign as the most memorable equine performance and memory of the 2015 Spring Meet for many observers, there were many other outstanding efforts that merit being a part of “Best of the Spring Meet” conversations. The Spring Meet’s strong schedule of stakes events include Grade I victories by Bill Cubbedge’s Molly Morgan, who took the $300,000 La Troienne Presented by TwinSpires.com for fillies and mares ages 4 & up for trainer Dale Romans in the final race of her career; Donegal Racing’s Finnegans Wake, who got up in the final strides to take the $500,000 Woodford Reserve Turf Classic on Derby Day for trainer Peter Miller and jockey Victor Espinoza; and celebrity chef Bobby Flay’s Dame Dorothy, who edged 2014 Eclipse Award Filly & Mare Sprint champion Judy the Beauty and Moonlit Stroll in a dramatic finish to win the $300,000 Humana Distaff for fillies and mares ages 4 & up for trainer Todd Pletcher and rider Javier Castelleno. John C. Oxley’s Noble Bird earned both his first Grade I victory and a guaranteed spot in the starting gate for the $5 million Breeders’ Cup Classic (GI) on Oct. 31 at Keeneland when he held off Claiborne Farmand Adele Dilschneider’s Grade I-winner Lea to win the June 13 Stephen Foster Handicap. Noble Bird won the “Breeders’ Cup Win and You’re In Classic Division” race by a head under jockey Joel Rosario for trainer Mark Casse, who earned his second Foster triumph. Earning a Breeders’ Cup starting berth on the same evening was G. Watts Humphrey’s homered Frivolous, who took the $200,000 Fleur De Lis Handicap (GII) at odds of 32-1 under veteran jockey Jon Court. Trained by Vicki Oliver, the owner’s daughter, Frivolous earned a spot in the $2 million Breeders’ Cup Distaff (GI) on Oct. 30 at Keeneland with her surprise in the Fleur De Lis, which made its debut on the Breeders’ Cup “Win and You’re In Distaff Division” race schedule. Frivolous had scored a 19-1 upset in winning Churchill Downs’s Falls City Handicap (GII) in November. Departing provided Claiborne Farm with a milestone victory when the 6-year-old gelding won the the $200,000 Firecracker (GII) on the meet’s closing night. The victory in the one-mile grass race was the 33rd stakes victory by the Paris, Ky.-based breeding and racing icon and pulled the farm into a tie with Calumet Farm for the all-time lead in stakes wins by an owner at Churchill Downs. Other notable stakes wins during a stellar Kentucky Derby and Oaks Week included a narrow triumph by Protonico over future Stephen Foster winner Noble Bird in the $400,000 Alysheba Presented by Big Fish Games (GII); a victory by Private Zone in the $500,000 Churchill Downs Presented by TwinSpires.com (GII); a front-running win by the Casse-trained Tepin in the $300,000 Churchill Distaff Turf Mile Presented by Longines (GII); a late-running victory by Divisidero in the $250,000 American Turf Presented by Ram Trucks (GII); a romp by unbeaten Competitive Edge in the $200,000 Pat Day Mile Presented by LG&E and KU (GIII), a race formerly known as the Derby Trial; unbeaten Promise Me Silver’s easy victory in the $200,000 Eight Belles Presented by TwinSpires.com (GIII); a gritty win by Power Alert (AUS)over the late-charging Undrafted in the $150,000 Twin Spires Turf Sprint Presented by TwinSpires.com; Feathered’s win in the $150,000 Edgewood Presented by Forcht Bank (GIII); and a victory by the Steve Asmussen-trained Cinco Charlie in the inaugural running of the$100,000 William Walker for 3-year-olds on the meet’s soggy “Opening Night” celebration on Saturday, April 26. The William Walker was named in honor of the African-American riding hero who guided Baden-Baden to victory in the 1877 Kentucky Derby. Other Spring Meet stakes highlights included a narrow win by Carl Pollard’s homebred Kiss Moon in the $100,000 Old Forester Mint Julep (GIII) on turf; an upset of reigning Breeders’ Cup Sprint and Eclipse Award Sprint champion Work All Week by trainer Chris Hartman’s Alsvid in the $100,000 Aristides (GIII); Street Story’s win in the $100,000 Winning Colors(GIII); Xtra Luck’s victory for veteran trainer Neil Howard in the $100,000 Louisville Handicap (GIII) at 1 ½ miles on turf; an easy win by the Bret Calhoun-trained He’s Comin In Hot in the 114th running of the Bashford Manor (GIII) for 2-year-olds; Cosmic Evolution’s upset under popular jockey Calvin Borel in the 115th running of the $100,000 Debutante Presented by GE Appliances for 2-year-old fillies; Island Town’s hard-fought win over favored Fame and Power in the $100,000 Matt Winn; and overnight stakes wins by Katie’s Eyes in the Unbridled Sidney; Courtesan and Ceisteach in divisions of the Keertana; Viva Majorca in the Kelly’s Landing; and Fioretti’s 25-1 surprise in the Roxelana that gave jockey Sophie Doyle and trainer Anthony Hamilton Jr. their first North American stakes wins. The battle for “Leading Jockey” provided drama through the final seconds of the Spring Meet as Corey Lanerie won the meet’s final race aboard Love Your Humor to earn his eighth Churchill Downs title in the track’s last nine meets. Lanerie edged nine-time Churchill Downs leading jockey Julien Leparoux 40-39 for the 2015 crown. Lanerie, who also won Spring Meet titles in 2012 and 2014, started Saturday’s final day of racing in a 38-38 tie and each had 10 mounts on the 11-race card. Robby Albarado finished third in the Spring Meet standings with 29 victories, and Shaun Bridgmohan and Brian Hernandez Jr. tied for fourth with 24 wins. Mike Maker saddled 23 winners during the meet to earn his fifth “Leading Trainer” title and his second Spring Meet crown. Steve Asmussen was the runner-up with 17 victories and was followed by Ian Wilkes (16), Dale Romans (13) and Mark Casse (12). Ken and Sarah Ramsey earned another “Leading Owner” title during the Spring Meet to extend their record string of meet honors at Churchill Downs to 24. The Nicholasville, Ky. couple had 17 winners during the meet and cruised to their latest title over Gary and Mary West, the runner-up with seven Spring Meet winners, and Midwest Thoroughbreds Inc. of Richard and Karen Papiese and Maggi Moss, who tied for third with six wins apiece. A donation of $117,705 was presented to Chicago-based Bright Pink, the only national non-profit organization focused on the prevention and early detection of breast and ovarian cancer in young women along with support for high-risk individuals. This was Bright Pink’s second year as a Kentucky Oaks’ women’s health partner, a focus that dates to 2009 when the event’s “Ladies First” theme was introduced. With the 2015 donation to Bright Pink, Churchill Downs has donated $174,705 to Bright Pink and a total of $706,705 to its Kentucky Oaks women’s health partners since 2009. $30,000 was presented to Horses and Hope, the cancer outreach initiative in Kentucky’s horse industry launched by Kentucky First Lady Jane Beshear. The donation represents $1 from each on-track sale of the “Oaks Lily,” the signature drink of the Kentucky Oaks, and will support Horses and Hope’s programs at racetracks and farms in Kentucky’s horse industry. With its 201 donation, Churchill Downs has donated $210,000 to Horses and Hope during its seven-year Kentucky Oaks partnership. Louisville-based food bank Dare to Care received a donation of $50,000 from the from the fifth annual “Taste of Derby Presented by Stella Artois” celebration in the North Wing Lobby of Kentucky Fair and Exposition Center on Thursday, April 30. The celebration of racing cuisine, celebrity and style attracted more than 1,500 patrons. Since the inaugural “Taste of Derby” in 2010, Churchill Downs has donated $138,760 to Dare to Care. The Sullivan University Center for Hospitality Studies Culinary Arts Program was awarded a $25,000 donation for the program’s ongoing support and participation in “Taste of Derby.” Faculty and students in the Sullivan Culinary Arts Program play a major role in the important Derby Week charitable event as the program opens its kitchens to visiting chefs and Sullivan students gain valuable experience while they assist in the event. Business was brisk at the Churchill Downs claims box during the Spring Meet as a total of 243 horses were claimed during its 38 racing days, a 34% increase from the 181 claims registered during last year’s spring racing session. Those claims totaled $4,779,500 and generated $286,770 in sales tax revenue for the Commonwealth of Kentucky. Churchill Downs racing resumes during its September Meet, which features 11 racing days (Thursdays, Fridays, Saturdays and Sundays) from Sept. 11-27. The track’s Nov. 1-29 Fall Meet will offer 21 racing dates on a weekly Thursday-through-Sunday schedule.